MGM/Fox has confirmed that November will see a 20th Anniversary edition of The Princess Bride. Yes, we did…two editions actually. The Dread Pirate edition and the Buttercup edition. They were the same edition with different covers. These were a step up from the 2001 Special edition that was released. The special edition was, of course, much better than the 2000 release that was …well just a plain old release. 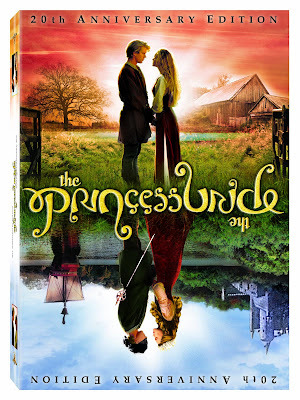 “As a special added bonus, The Princess Bride 20th Anniversary Edition DVD features “The Official Princess Bride DVD Game.” Produced by Worldwide Biggies, the game leaves behind the simple text-based, slideshow nature of most DVD games, and transforms the film’s favorite live action actors into fully animated characters in a graphic novel type setting. I have to say, it sounds fairly cool. I am guessing at it will also contain of the bonus features from the previous editions. Once I have it, I will let everyone know it is worth adding to your ever expanding Princess Bride library. For more info on upcoming DVD releases, check out the Crimespree DVD Calendar. I have bought enough versions of this. No more! But if the game is cool, I will likely break down and buy the damn thing.